To understand what data cabling is, it’s important to define a data cable. A data cable can be defined as a media that allows the transmission of baseband from a transmitter to a receiver. Ethernet and token ring cables are perfect examples of data cables. The term network cabling is usually used to define the process of installing data cables. Data cabling which is also known as a network is very common in both commercial and domestic applications. Computers and data terminals seldom separate today. They are connected together through networks so that they can be able to communicate with each other. Networks also make it possible for data inputs to be collected as well as analysed centrally. In its most basic/primary form, network cabling consists of pairs of copper cables which are twisted to reduce electrical interferences caused by other electrical equipment and network cable wiring. One of the best ways of eliminating electrical interferences is sending the signals via light using glass fibre cable. All in all, both copper and glass fibre cables have their own pros and cons. Who needs data cabling installation? As mentioned above data cabling installations are crucial for both commercial and domestic applications. For instance, all tills in a shopping mall must be linked for price changes to be relayed simultaneously so that all the sales information obtained from bar code readers is gathered centrally to offer exact data on merchandise checked out. Data cabling installations and network installation are also important in learning institutions i.e. schools, colleges, universities so that all computers can be able to share resources i.e. a set of programs. Even homes need data cabling where there is a need to connect one or more computers among other devices i.e. telephones as well as share computing resources such as printers. Data cabling simply forms the network that interconnects systems/devices to allow data sharing, resource sharing, communication etc. It is therefore inevitable in most settings today. Data cabling in Toronto: Why choose us? In case you are interested in the best data cabling Toronto services, look no further. 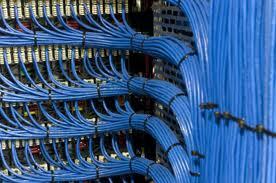 We are the leading communications and network cabling installations company in Toronto, Canada. Our vision is to ensure both domestic and commercial ventures throughout Toronto and neighbouring environs receive the best network cabling services. We offer high quality and reliable services to ensure communication, business profitability as well as growth is supported effectively by technological enhancements. We deliver effective network cabling solutions from simple to complex network installations. We are able to discharge our duties effectively because we have the best team of cabling professionals in Toronto. Our data cabling and computer network repair professionals are highly skilled and experienced which makes them capable of handling all kinds of data cabling tasks you can think of giving you the best data cable capabilities to match your needs perfectly. Our cabling professionals also undergo constant training ensuring they are fully conversant with the latest industry standards and regulations. Our reputation is also unmatched. We have a long list of satisfied and repeat clients. What are you waiting for? Choose us today for all your data cabling Toronto needs. You wont regret it!